A “friend” emails to inform me that “you’ve got to weigh in on Arthur Laffer’s op-ed today in the WSJ.” Thanks, pal. That’s five minutes of my life that I’ll never get back. increase in the unemployment rate. Those who argue that things are different today don’t have the data to back up their claims. Yep: Laffer is seriously suggesting that unemployment benefits, which, according to his own chart, begin rising after unemployment rises, are what cause unemployment to rise. 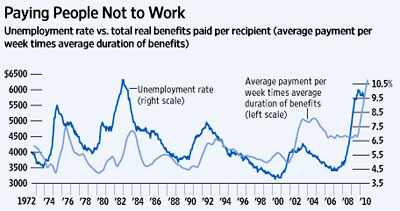 It’s groundbreaking stuff, but as an exercise for the reader, can you think of an alternate mechanism to explain why total unemployment benefits paid out might go up when the unemployment rate goes up? Anyone? Take your time. I know it’s a chin scratcher. Even by Laffer/WSJ standards this whole thing is pretty surreal. Are business executives who read the Journal really so gullible that they buy this stuff?